Almost as I was writing yesterday’s post about beggars, the Supreme Court was rapping state governments on their knuckles for neglecting the needs of the homeless (see news report). Every year when the cold wave strikes, the Supreme Court starts feeling terribly protective about the homeless people, orders reports on homeless shelters, orders governments to rebuild and repair these, etc. At micro Home Solutions (mHS), where I now work, we have been involved peripherally with night shelters as part of our larger work on low-income housing. 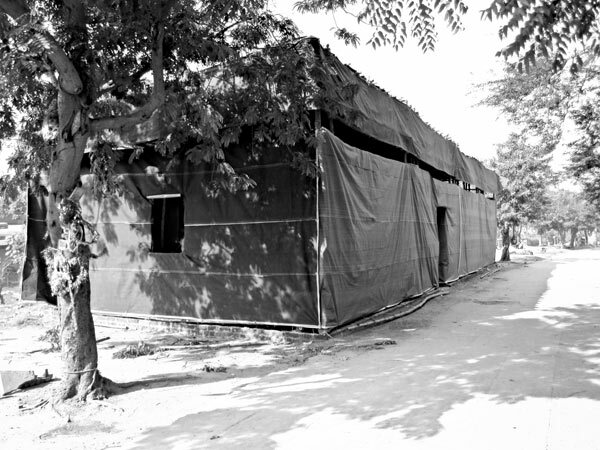 A few years ago, mHS built two bamboo night shelters in Delhi with NGO partners, one of these is still standing on the banks of the Yamuna. Partly because of the court’s seasonal reaction, night shelters wax and wane in this city, increasing in number once the rap comes in wake of the cold wave! The biggest problem is offering a sustained shelter option, though, is that of maintenance. Once the cold season goes, they fall out of repair and the homeless go back to the streets….therefore, these homeless (beggars included) can never really be rehabilitated because they cannot afford to pay rents and there is simply nowhere else to go! Legally, the poor cannot be charged for these night shelters. We fail to understand why they cannot be charged for services, though. Many of the homeless are daily wage workers, rickshaw pullers, rag pickers, etc who cannot afford to pay rents, but are also not exactly sans income. They would benefit from clean toilets, health facilities, lockers for their belongings, clean bedding, etc. The nutritional needs of the homeless are also critical. The shelters would very much benefit from soup kitchens, so the poor get a healthy square meal a day, saving them from starvation and death. A holistic approach as opposed to simply putting a roof over the heads of the homeless is certainly warranted. The other side of this picture is a concerted effort to address the supply of low-income housing, especially rental housing (and dormitories) that has recently re-entered the policy discussion after years of being shunned. Here too, how to and who would maintain and organize these is a barrier that needs to be addressed. If rental housing is created, at least the homeless with income would have an option for shelter. Of course, those without income would need a different approach entirely, something that incentivizes them to enter the workforce as well, and provides some opportunity to do so. Essentially, it’s not just about solving the problem of housing the homeless. Its also about providing that opportunity to progress to the next level, and then beyond, and so on and so forth. That upward mobility that even the US has been criticized in a recent Time survey for not being able to adequately provide for marginalized populations. In offering a slim chance for upward mobility to these people, we would be building the future of the city and the nation in the best way possible, from the bottom up! Posted on January 10, 2012, in Urban Planning & Policy and tagged homeless, housing, poor, poverty, shelter. Bookmark the permalink. 8 Comments. The problems at the bottom of pyramid are far too many.A shelter for the homeless ,perhaps deserves more attention than other challenges. One of the main reasons of housing shortage in del ( besides many other archaic regulations) . there are proposed changes that seem to have a lot of supporters, but lets see….. RAY is again being looked at as the manna from heaven for low income housing, which I find really crazy given its myriad implementation problems. Our pilot project (done by MHT-mHS) has been ready for months and Delhi has not decided on the implementation agency, for instance! Let us not forget that governments and their friends, corporations create these problems. The privileged few reap the rewards of the working poor. Nice!enjoyed reading every bit of it. thanks. do post on your profile whenever you like something, so more people can read!